A pair of fantastic reclaimed Art Deco cast iron window frames that have been converted into mirrors with new mirror glass fitted to each panel. The frames have an unusual and very attractive shape with large circular design at the top and 5 rectangular sections below this. The frames have been stripped and lacquered and have a silvery, burnished finish. 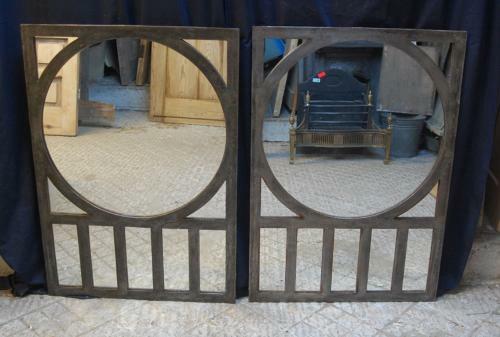 The mirrors have a wonderful industrial appearance paired with the interesting period design. The mirrors are heavy and very well made and will need to be fitted securely to the wall. The mirrors could be set into a wall space, making a fantastic interior statement or we could fix brackets to the frame for an extra charge, allowing the mirrors to be attached to the wall. Another alternative for wall mounting is to make a timber surround for the mirrors, this can be made for an extra charge, please contact us for a quote or further details. The frames are in very good solid condition with some slight signs of wear as expected of antique items. The frames have some light tarnish, scratches and light patches of surface rust around the frame edges, all adding to their industrial feel. Perfect as an interior décor feature, the mirrors have an abundance of industrial style and charm.